Fire Door Inspections | Book Now! There may be a number of reasons why you may need an inspection for your fire-resistant doors. You may have a fire door that’s been installed for many years and you’re looking for advice on upgrading it, or you may be in need of repair and replacement services for your fire doors. Whatever the reason, it is essential that regular inspections are carried out for fire-resistant doors in order to ensure that they will offer the safety and protection you need when required. To have your fire doors inspected by an expert, you’ve come to the right place — Element Fire Door Services possesses unrivalled experience when it comes to all things to do with fire-resistant doors. Element Fire Door Services offer fire door inspections by a licensed fire door certifier. Whether you manage a building or just require one fire door to be inspected, do not hesitate in contacting us today. 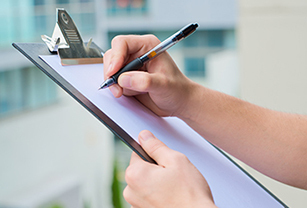 We provide a full report including any defects and the action required to gain compliance. Along with the inspection report we can submit a quote to carry out any necessary repairs and replacement services. Element is known throughout Brisbane and the Gold Coast for being the leading providers of installation, maintenance, repairs and replacement for fire-resistant doors. With many years of experience in the industry and a commitment to always staying up-to-date with the latest trends in fire doors, you can count on us to receive the fire door solutions that will perfectly suit your requirements. To book an inspection for your fire doors or to enquire about the other services that we offer, we’re always happy to help. All you need to do is get in touch with us today by calling 0405 783 032 or by filling out the contact form on our contact page, and we’ll get back to you in no time. Whatever your needs may be, you can count on Element to get the job done. Element Fire Door Services are the only company you need for all your fire resistant door needs. With over seven years experience, Element know all there is to know about fire doors with a fresh and up-to-date understanding of the industry and product itself as well as personal and knowledgeable customer service. Whether you reside on the Gold Coast, Sunshine Coast or Brisbane, Element offer a convenient, professional and comprehensive service to ensure your structure is safe in the occurrence of a fire. Element Fire Doors © 2019.